Hi friends... How about having a Shahi Paneer i.e. Cottage cheese cooked in Almond Gravy in your Lunch or dinner menu? 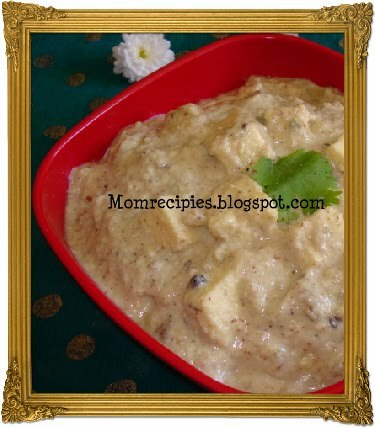 Shahi Paneer is a rich and creamy Mughlai dish.My family love this dish very much so I prepared it last weekend for lunch.It came out much very delicious and tasty. So I strongly recommend to try this dish to all my friends. 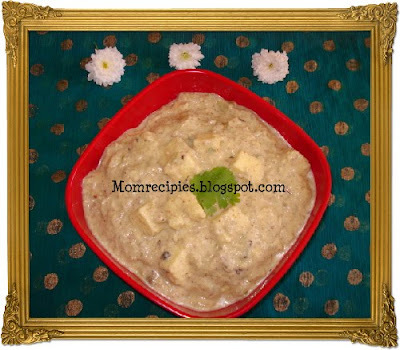 It is a perfect side dish with Chapatti or Naan or Shahi Pulav. 1) First cut the almonds into pieces and grind into smooth paste using milk. 2) Heat oil in a pan add whole garam masala,add finely chopped onions fry them but don't brown them add ginger garlic paste . 3) Add white pepper powder / black pepper powder,coriander powder and almond paste. 4) Add good amount of water. Add salt and bring it to boil.Keep Stirring frequently so i doesnot stick to the bottom . 5) Cover it and Cook at least for 30 mins then add paneer cubes , sugar ,Garam masala . 6) Sprinkle little bit of khoya and cook for 5-7 mins. 7) At last add cream cook for 2 more mins. 8) Garnish with fresh chopped cilantro. Serve with hot Naan , Shahi Pulav, Jeera rice, Chapatis ,Roti. 1. If you like thicker or thinner gravy, adjust the amount of water. This dish looks really rich and creamy.Perfect with hot phulkas.